I would like to have no limit on the amount of travel on the slow motion controls. Its one of many things I don't like about the stock mount is when you find something interesting you can only track for so long until you have to back it off and refind the object. As well as a more sturdy tripod is another big thing I want. I've looked at the Meade LX70 that is on sale now, would that be a good mount that will grow with me? Any suggestions will be welcome as Ill keep an eye on used mounts as well as new ones. Edit: forgot to mention I do not need GoTo as I'm under dark skies when there is no clouds. Also love the simplicity of the AltAz mounts but the idea of being able to just having to move one axis on EQ mounts sounds interesting. Can EQ mounts be used in an AltAz mode? Edited by maknswarf, 15 April 2019 - 03:26 PM. Awesome suggestion! I love the ease of use with the AltAz mounts, do you have one of these? Is the tripod sturdy? Edited by maknswarf, 15 April 2019 - 03:30 PM. A small apo? Depends on how small you go. I would suggest for $200 you take some serious thought into the LX70 on sale now. This early into observing, you never know if you’ll go bigger on refractors, or even Maks. At the price point, it’s hard to beat for how many different OTA’s you’ll hold with no problems as compared to a smaller alt az mount. That mount looks really tempting its just kinda hard to find any reviews on it. Also, is there a way to have an AltAz mode for quick observations without having to align it everytime I take it out? Yes, I have one. It is sturdy to about 10-12 pounds as long as the moment arm isn't too long. It doesn't work well with my 100mm f/9 (about 13 lbs), but it does pretty well with my 100mm f/6. A 127mm Orion Apex Mak does fine on it. The weak point is the extruded aluminum tripod. There are some posts here on CN that describe stiffening them with wooden dowels and such. That does help, but if you want to upgrade later, you could go for wooden legs. Don't let that scare you though. For what you are suggesting for your future scopes, this is a very nice mount and tripod. Also being visual, line up isn’t as important. Getting your latitude close and setting the mount pointing north, gets you pretty much going. When you read about people taking importance in lining up a GEM, that’s because they’re setting up for AP which is critical. Jond105's suggestion looks really good, especially at the sale price. If it can be used in alt-az mode, then you have the option to use the GEM configuration in the future. It is quite a bit heavier than the Porta II (35lbs) so not as grab and go. Excellent suggestion! Edited by cookjaiii, 15 April 2019 - 03:48 PM. Thanks. Yeah I also have had a couple ED100’s now, and if ever falls into one, like you, he’ll wish he had it. I also tried this on a GSO Skyview Deluxe Alt Az mount and it was pretty bad due to momentum arm, although I found it rode beautifully on an Orion versago ii with the head on my CG4 legs. Edited by Jond105, 15 April 2019 - 03:52 PM. 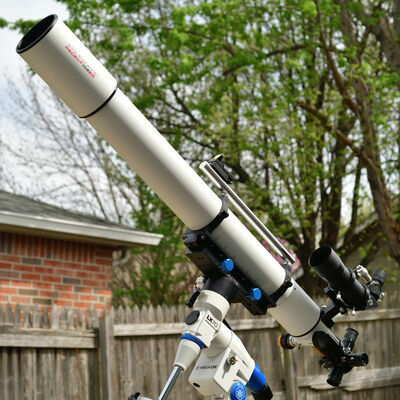 Yeah looks like Ill get the LX70 as I would rather it be good to go with almost anything less than 5 inches (the apo if I get one would be a 100mm-80mm), anything bigger it will be a newt on a dobsonian. Also if I truly need that quick setup I'll keep the stock AltAz mount since its not worth any real money. That way I could have a 127mm Mak, or C5, on the LX70 and the 102mm on the stock mount. As you can tell I overthink things too much😁 but when I buy something I want to keep it around for a long time. Also I like the idea of having multiple different scopes in the field with me for those long sessions. Edited by maknswarf, 15 April 2019 - 04:20 PM. I’d still recommend a Vixen’s Porta II for a newbie. Lighter (so more grab-and-go) and very simple (no learning curve really). I have a Porta II outfitted with an ADM saddle, KK Handle, riding on a Vixen HAL tripod. I agree it's a fantastic grab and go mount and plenty stable with the small scopes I put on it. It is especially nice for sweeping along the Milky Way with a small wide FOV scope. 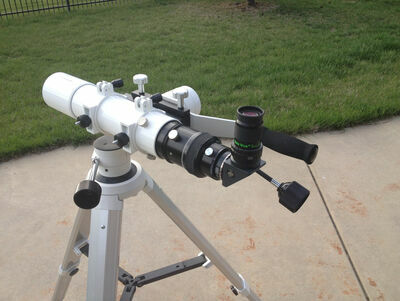 I've also used it with a de-forked ETX 90mm Mak and it works well for the Moon, double stars, planets etc. The LX-70 is a little more work to set up. I carry it out with the legs folded in (but extended) and the head installed. Then add the spreader and counterweights, etc. I have just an RA drive fitted and use a manual Dec slo-mo knob (Vixen cable + knob). The LX-70 can support some of my larger scopes - 4" refractors, 5" & 8" Mak's and even the 152mm refractor (but that's pushing things a bit and requires 2 counterweights). With the drive I really enjoy sitting and observing the moon for extended periods with only very minor corrections needed. My polar alignment routine - latitude set on the head and plop the scope down facing ~North. Good enough for visual up to 240x. If I had to pick one, and I was looking to grow into other (somewhat larger) scopes in the future i would pick the LX-70. Cannot beat the performance to price ratio right now. It's not perfect - but it does all the important things well enough and it's stable. If you are going to observe at high power and set up on hard surfaces (like concrete) then also invest in a set of vibration supression pads - like these or similar: https://www.astronom...s-set-of-3.html regardless of whether you go with a Porta or LX-70 or anything else. Edited by Don Taylor, 15 April 2019 - 07:38 PM. Thank you very much for the comparison! I'm going to buy the LX-70, just because it seems much more capable for future scopes under 5" I don't mind the more complicated setup as I'll learn how to do it during daytime and youtube videos that I found. Don - Where did you get those really cool matching blue knobs? I see you are located on the Eastern Shore of Maryland (as am I). Be advised I will be installing a new telescope this weekend. It just cleared customs in NYC and should arrive later this week. If past patterns persist you can expect a prolonged period of rain and cloudy skies starting Sunday! So I found out the LX70 at high point is now completely sold out. However, when they responded to my email they recommended the CG-4 from Celestron, what do you guys think of this mount? Dangit! I'm so glad I grabbed mine - it should be delivered tomorrow. CG4 with an Orion single axis drive is the mount I use. It holds the 120mm f/8.3 achro fine. It gets up to about 13-16lbs with my big finder and ES82 30mm. It’s a fine mount. Not as stable as the EQ5, so I can’t lie about that. But, in my opinion isn’t that far behind either with a properly balanced heavy refractor on it. 150 Maks, 120 achros, will work just fine with it. I also have the SVP 16” extension for it for the long refractor. I love mine, and have never thought to replace it. Awesome, sounds like it'll be fantastic for my very light Meade 102mm and the small Mak or SCT I might get in the future. Thanks for the advice! I also just discovered the ES Twilight 1 AltAz mount while it is not as capable as the CG-4 as its limited to 15lbs, any thoughts on this? Edited by maknswarf, 17 April 2019 - 05:24 PM. Search for info about the Twilight I on these forums. I don’t have any personal experience, but my impression from what I have read is that it can’t really support the stated 15 lb payload.